Man's best friend will really appreciate you storing their treats in this airtight jar with the dog bone on the top. 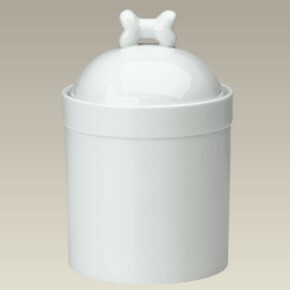 This beautiful porcelain jar measures 7 3/4" high and 4 3/4" in diameter and will keep Fido's goodies fresh and moist. Made in China, it's dishwasher safe. Please remove the silicone seal if decorating and kiln firing.